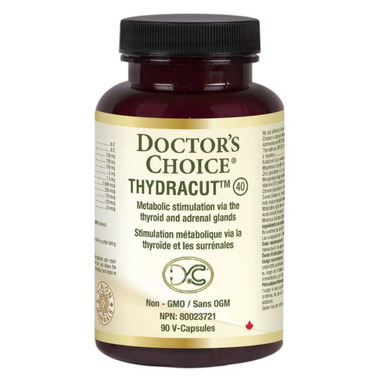 Doctor’s Choice Thydracut is a unique weight loss formula designed to increase metabolism by stimulating the production of thyroxin, a key thyroid hormone. Raising the Basal Metabolic Rate (BMR) is the key to the fat-burning process, which of course leads to loss of excess weight. As always, Doctor’s Choice ensures that the highest-quality ingredients are used, in a combination meant to enhance the health of the thyroid gland, which regulates the metabolism and calcium balance. Organic raw thyroid and raw adrenal tissue concentrates in homeopathic form help both thyroid and adrenal function, but it is the addition of the amino acid L-Tyrosine, bladderwrack derived from kelp, and selected trace minerals, acting in synergy, that makes this formula special, as it supports different aspects of the complex metabolic system. Dosage: Adults: Take 1 capsule daily with a meal, a few hours before or after taking other medications, or as directed by your healthcare provider. Duration of use: Consult a health care practitioner for use beyond 3 months.